Status of the Lake Junaluska eagles remains a mystery but I still have my fingers crossed for a successful nesting venture. There was some disturbance near the nest a week or so ago – tree trimming on adjacent property – and for a day or two it seemed the eagles were MIA. But they have been seen recently, foraging on the lake and perched at the nest. In fact, I received a Facebook message from one of the eagles’ Lake Junaluska neighbors noting, just before dark yesterday, they had seen both eagles return to the nest and, “After each was in the nest for awhile, they both came out and sat upon limbs – one on one side of the nest and the other on the other side of the nest.” So it’s evident the birds are still attending the nest. Trying to establish any kind of definitive timeline from accounts and the occasional peak at the nest is, at best, iffy but I think there could be chicks in the nest – and if that is the case they should be showing themselves soon. It was believed back around mid-February that the pair was incubating. 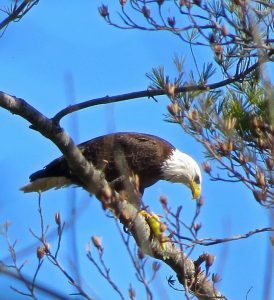 When I wrote about them in mid-February I quoted Bryan Tompkins of US Fish & Wildlife, who noted, “We have visited the nest several times and believe the female to still be sitting on eggs. It is getting close to hatch though and could happen anytime in the next few weeks (if it hasn’t already). The nests are fairly deep so it will be a while before chicks are visible.” That was basically a month ago and it could have been a week or two more before any eggs hatched – say the end of February. It could easily be another 5 to 6 weeks after that before the chicks would be large enough and adventurous enough to poke their heads above the rim of the nest. So my fingers will remain crossed until, at least, the first week of April. Of course, as much as I hate to think about it, there is always the chance for nest failure. It’s not uncommon for young, inexperienced raptors to have failed nests and then, as they get older, they become more successful. I don’t have any clue how old and/or experienced this pair of eagles is so nest failure is always a possibility. But I’m definitely still in the wait and see camp. Hopefully we will get to watch the young eaglets begin to venture out of the nest. They will often flap from one side of the nest to the other and then begin to “limb hop” as they learn to get their wings under them. Parents sometimes coax this kind of exercise by flying above the nest with food and calling to the eaglets, encouraging them to climb out of the nest. But the parents’ work is not done even after the eaglets fledge. Parents generally continue to feed their young for another month or so after they fledge. I’m still keeping my fingers crossed and keeping this scenario in my head and looking forward to much more exciting “eagle watching” at the lake.